2018 Virginia General Assembly in session. Photo by Marco Sanchez; courtesy of Piedmont Environmental Council. On March 9, Virginia Governor Ralph Northam signed legislation bringing massive changes to energy policy in the Commonwealth, including a new model for determining electric rates paid by millions of Virginia families and businesses. 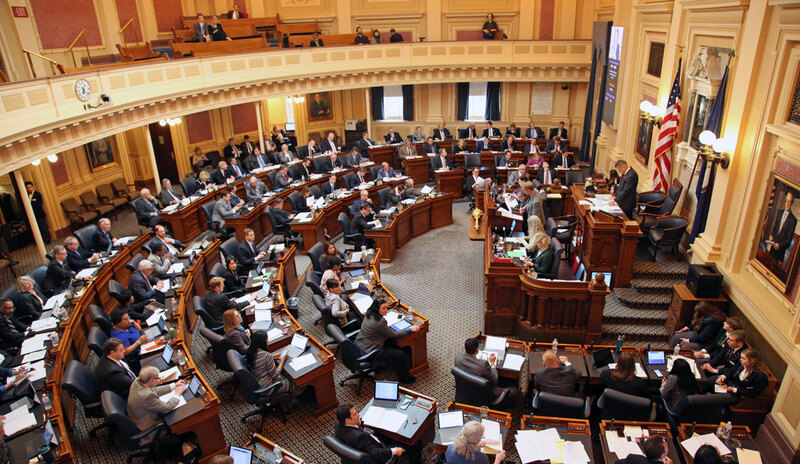 Written mostly by and for Dominion Energy, the legislation was one of the most hotly contested proposals during the 2018 General Assembly session, receiving unprecedented resistance from lawmakers and grassroots. How did your elected officials vote? Send a message to your delegate and senator today. In 2015, the General Assembly passed the “rate freeze” bill, which stripped the State Corporation Commission’s (SCC) authority to determine the rates Virginia’s utilities (Dominion and Appalachian Power Co.) can charge customers for a period of several years. Dominion’s narrative to legislators was that complying with the federal Clean Power Plan would increase the cost of electric service so much that rates needed to be “frozen” in place to protect customers. It also meant that the SCC could not order Dominion and Appalachian Power to issue customer refunds or lower electric rates. The utilities ended up overcharging their ratepayers hundreds of millions of dollars. This year, with the impending demise of the Clean Power Plan, the rate freeze was no longer tenable politically or from a public relations perspective, so utilities and legislators alike were determined to repeal it. But instead of simply returning to the old system of rate regulation, Dominion used this as an opportunity to establish a new way to boost profits. In Virginia, Dominion and Appalachian Power are guaranteed to recover all of their costs from customers, plus an approximate 10% rate of return, relatively risk-free. The more they spend, the bigger their profits. However, as we become more energy efficient and large fossil-fired power plants become more difficult to license, utilities are turning to expensive “grid modernization” projects as their cash cows. Dominion had to ensure that attempts to simply end the rate freeze and restore SCC authority failed so that the General Assembly would be forced to either let the unpopular rate freeze stand, or pass Dominion’s bill. Hence the “Grid Transformation and Security Act” of 2018. Dressed up as a plan to create a clean, modern, secure electric grid, the legislation further erodes regulatory oversight by the SCC, giving utilities the flexibility to spend a lot more of our money, with only weak commitments to a cleaner grid. Essentially the bill provides a new regulatory model which restores SCC review of utility rates, but now the utilities can manipulate the accounting. Here’s a short list of bells and whistles rolled into this legislation in order to secure support from lawmakers and various stakeholders. To be clear: Appalachian Voices and many others have been advocating for years for increased investments in renewable energy and energy efficiency. 5,000 megawatts of solar and wind are declared “in the public interest,” which means projects are more likely — but not guaranteed — to get SCC approval. The two utilities must apply to the SCC for approximately $1 billion in energy efficiency programs combined over the next decade – again, there is no guarantee of SCC approval. Dominion must increase spending on energy assistance and weatherization programs for vulnerable populations. Appalachian Power must fund its programs at current levels. Dominion will refund $200 million to customers for overcharges under the “rate freeze” in 2015-16, although the SCC estimates that the company overcharged customers between $300 and $700 million during that time. The utilities must pass along savings from the federal corporate tax cut. They would have been required to return this money to customers eventually, but now it happens earlier. Now let’s take a look at how the legislation does — and does not — restore SCC oversight of monopoly utilities. The bill reinstates SCC rate reviews, but it allows utilities to front-load some costs into one review period, an accounting maneuver making it harder for the SCC to lower rates or order customer refunds. Utilities can reinvest 100% of overcharges in grid modernization, grid hardening, renewable energy and energy efficiency projects instead of issuing refunds. This gives the companies additional flexibility to ensure that rates will not be lowered by the SCC, though the projects themselves must be preapproved by the SCC. (The so-called “double dip,” which would have allowed utilities to charge customers additionally for the value of new projects purchased with overcharges, was removed from the bill). Any potential rate reduction in Dominion’s first review after the law is effective is capped at $50 million. The good provisions are outweighed by the unprecedented rollback of the SCC’s authority to regulate the costs that monopoly utilities pass on to their customers, who cannot choose their electricity provider. The bill allows utilities to manipulate the accounting of costs, likely preventing the SCC from setting rates where they should be. And repealing the SCC’s authority to determine whether the costs of undergrounding projects are “reasonable and prudent” means that, for a limited set of projects, we essentially now have unregulated monopolies. This didn’t have to be so complicated. The General Assembly could have simply ended the rate freeze in one straightforward bill. 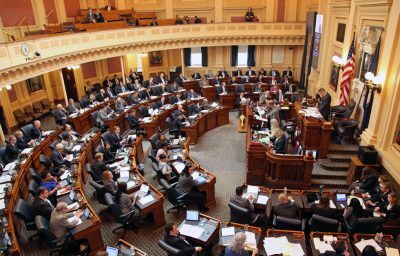 But various attempts to advance simple repeal bills and other alternatives were stymied by Dominion’s effective lobbying and by political inertia. In addition, the 2017 election for Virginia’s House of Delegates saw a consumer-populist wave, with 13 victorious delegates (12 of them freshmen) pledging not to accept campaign donations from Dominion or Appalachian Power. Other lawmakers in Richmond have already foregone donations from regulated utilities even if they haven’t signed a pledge (see Del. Keam’s March 15 op-ed in The Washington Post). The significance of this cannot be underestimated; it amounts to a disruption of business as usual in Richmond. This is a watershed moment in a movement that citizens have been building for years. The issue of regulating powerful monopolies is now front and center in the eyes of lawmakers and the public. When ratepayers and citizens stand up, we can force the legislature to place the public interest above monopoly shareholders’ interests. While the new law purports to set energy policy for the next decade, there is nothing stopping lawmakers from getting to work now to fix its egregious flaws in 2019. We have the momentum. Now is the time to keep the pressure on. Send a message to your Virginia delegate and senator today. A native of northern Virginia, Peter holds a J.D. from George Mason University and is a member of the Virginia State Bar. He joined Appalachian Voices in 2016 as our Virginia Program Manager with a keen passion for transitioning the region from fossil fuels to a clean energy economy.